Karylle will wear an Albert Figueras creation (main photo) when she sings the Philippine national anthem at Manny Pacquiao's fight against Oscar dela Hoya this December. Karylle is handpicked by boxing champ Manny Pacquiao to sing the Philippine national anthem at the Pacquiao-dela Hoya dream match in Las Vegas on December 6. The new ABS-CBN star will don an Albert Figueras creation when she sings at the MGM Grand Hotel Garden. New York-based Figueras will create a stunning wine-red Filipiniana terno for the statuesque singer. The basic gown, cut in a serpentine line with a heart-shaped neckline for the bodice, will be draped with checkered dupione silk. It will have a silk tapis woven with a checkered pattern of lines in a cacophony of colors of lively red, orange, yellow, green, aqua, and pink; superimposed on paisley and royal blue acanthus leaves outlined with Mutzumo cut beads, and glass beads with a hologram of flat sequins. The tapis will take on a new look by way of embroidery and beadwork embellishments, giving it a scalloped finish. "The terno manga likewise would echo the ornamentation of the tapis," says Figueras. 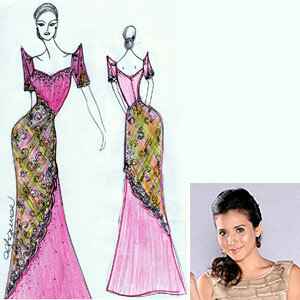 The terno will be sans the usual panuelo, which is accustomed to traditional dresses and gowns. The bodice will be accented with Swarovski crystals to give more emphasis on the heart-shaped neckline, and low-cut back. Figueras adds, "Karylle will sashay in the arena with a pair of shoes of the same material and pattern of the tapis. The total look would be that of sophistication and understated theatricality. Karylle is a boxing and kickboxing enthusiast herself. Her grandfather Carlos "Sonny" Padilla Jr. refereed the historic boxing match between Muhammad Ali and Joe Frazier, "Thrilla in Manila," held in 1975.